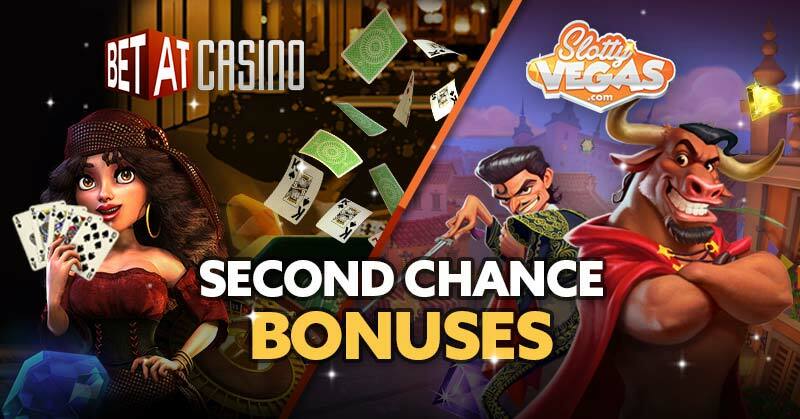 Second Chance Casino Bonuses and Why They Rock! As Slot Players, we’re always on the lookout for the next best thing, whether that be the next best online casino to hit the scene. The ones with that special sauce, a perfect blend of usability, fresh content, kickass new features and of course, great casino bonuses. I’ve played at online casinos now for close to 10 years, I’ve been around the block a few times when it comes to casino products and taking up Welcome Bonuses, I’ve learnt things the hard way so hopefully, the tips and advice I pass on to you stop you from making these costly mistakes. As for bonuses, there’s pretty much as many types of bonuses as there are operators to boot. On top of that, each casino has their own interpretation of how to implement them, for us players resulting in more time spent digging through pages of terms and conditions than actually enjoying the gameplay itself. But of course, not all casino bonuses systems are created equal, and not all bonuses are even worth taking. While there are many types of bonuses, my focus in this article will be toward the deposit bonus, or more particularly – the registration welcome bonus. As it stands, each product offered by casinos usually conforms to a particular win flow model, which dictates the priority of how real and bonus funds are deducted and credited to your balance during gameplay. There are two main models at play here and each operator will generally conform to just one. Example A is the merged model which combines your real funds and bonus funds into one balance, and then applies a wagering requirement to the full balance – meaning you won’t be able to withdraw your winnings until this bonus-based condition is settled. The deposited amount would usually be the maximum you can withdraw of your balance prior to completing the wagering requirement, so that big win which you celebrated already is going to have to be set on ice somewhat, as you’re pushed to play more to see out the wagering requirement tied to the fact that you claimed a promotional bonus. There is a better model, though, which sadly has taken a backseat in the modern casino. I am of course talking about Example B the segregated model which allows evermore freedom in comparison to its merged, uglier cousin. So, what is a segregated bonus model? How does it work, and why is it better for us players? The answer is simple really. As the name suggests, it segregates the real and bonus balance and treats them separately. Real funds bets and wins are reserved for your real fund’s balance, while your bonus balance is the one which takes on the wagering requirement. You bet with real, your wins are real. You bet with bonus funds, your wins are bonus funds until you complete the wagering requirement. The benefit? Freedom of funds, peace of mind. If you win with your money, you’re free to do whatever you like – be it continue playing or withdraw your balance, usually prompting you to forfeit your unused bonus should you wish. If luck isn’t on your side however and your real balance is depleted, you now get a second chance at winning. Hence comes the name, the “Second Chance bonus”. It’s the promotional side of your gameplay which didn’t condition your real fund’s gameplay prior, and which has now only come into play because you need it to. Are There Any Cons to a Segregated Model? The best part of these types of bonus is that your real gameplay isn’t conditioned by a casino bonus you might not even touch – surely that can only be a good thing! The downsides are that the wagering on the bonus doesn’t kick in until you start to play with the bonus funds but this is a tiny negative when comparing the fact that you can withdraw you real money funds and real money winnings at any point! So Where Can I Find This Kind of Second Chance Casino Bonus? The 2 absolute best online casinos that offer this type of bonus not only on the welcome bonus but all subsequent bonuses offered at their casinos are BETAT Casino and Slotty Vegas Casino. Their bonus model is by far the absolute fairest I have come across out there. Coupled with a strong portfolio which includes the likes of Netent and Microgaming, their bonus structure gives me no reason to look elsewhere for my gaming style.